CARRIE: So you and Brian are finally dating huh? CARRIE: You know, Get Smart jumped the shark as soon as Max and 99 became a couple? ABBY: Are you saying that Brian and I are going to jump the shark? ABBY: Carrie, this is real life. You canâ€™t jump the shark in real life! NICK: (walking past) Hold my calls; Iâ€™m going to take a nap. It is not real life, so it is possible to jump the shark. I hope, however, that the comic does not do so. you can always count on nick to show you exactly how arrogant people can be… and how sad a person can get. well i bet he brightens everyone else’s days. 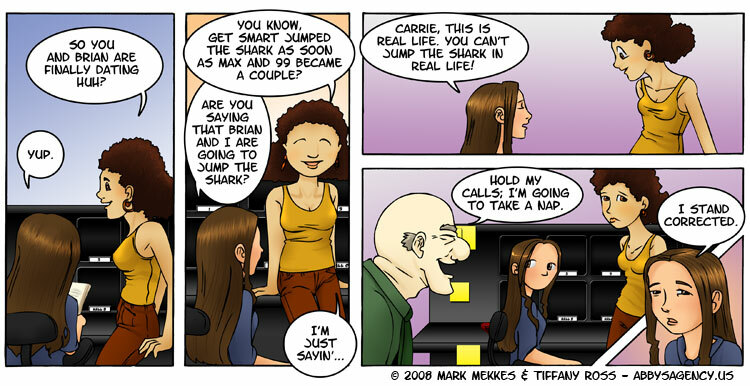 Tiff makes this comics, it can’t jump sharks, the sharks will jump it!!! What the hell is jumping the shark? jumping the shark is basically when a show starts going downhill and never picks up again.